Charles got his heirs from Diana whom IMO he picked out as a broodmare and treated her coldly after he ditched her. If surrogates were allowed back then perhaps Charles would have had a cheaper payoff but he had to marry the mother of his heirs. In any case his own flesh and blood children eventually inherited the money, thanks to Diana's will. I don't think Charles was ever close to bankruptcy though. I think that if Camilla even tries to get it all, Harry and William might end up going full throttle on her; as it is they are restrained enough, but after Charles is gone, there won't be anyone left to protect Camilla at all. The flunkies will crowd around William and Harry and William will be Head of the House of Windsor and King of England & Commonwealth. I wager W & H will make that difficult; Tom and Laura have done very well off of the backs of Camilla and Charles' marriage and Tom was supposedly a bad influence on Harry. Camilla has proven to be a master at manipulating Chuck. So I assume, that she probably made a deal prior to marriage. Camilla has Raymill, Kate and her family have Midd Manor. The new generation of wives, appear to have protected themselves against future fallout. When Camilla married Chuck, she was on even shakier ground. I can only assume that she negotiated some things up front. Cam is anything but naive and I don't see her leaving financial security to chance. Trusts were probably setup for Cam and her kids. William will receive the most, then Harry. Wm and Harry will not be denied their birthright. 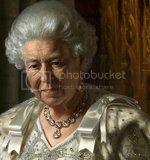 The Queen Mother is a good example, she had her own income but was dependent upon her daughter to keep up her lifestyle. HM is a benevolent Queen and is generous. I don't see Wm having the same approach. Cam will be given what is fair by Chaz, Chuck and Cam won't count on Wm to provide for her. Wm knows Cam knows how to play dirty and has the goods on him. I suspect he will be civil if Chuck goes first. Civil but not overly generous. Despite all that happened, I wager that HM would gladly take up the gauntlet against Camilla with a vengeance. If Camilla hadn't happened, Diana would still be around, being a huge asset for the monarchy, keeping her style up, and providing the press with plenty of things to write about. Diana wouldn't have been driven out of Britain, into the arms of fayed, and then end up dead in a car crash in Paris leaving the princes rudderless and without guidance. So if Charles dies before, I think HM will dole out serious payback. If not for Camilla, Kate and the Middletons wouldn't have happened. You're right; I think that if you are the mistress of any married guy, you have thrown away any chance of marriage to him or any decent man. Camilla was just a distraction and put things way off track the minute that marriage happened. William and Harry were on track, the RF was calming down, Camilla was accepted as his companion/mistress and if she didn't like it, tough rotten luck. Marrying her to ensure she sits at a front pew was a huge mistake and she's been nothing but expensive. If Charles goes before HM, HM will make sure Camilla pays in spades for the mess she's made of a lot of lives. I wager the courtiers will enjoy seeing Camilla suffer; all that work and supposedly Camilla is quite sharp and demanding of them. I thought they loved her, all that sucking up to them. Only openly and frankly I wouldn't want to end up being Camilla once the courtiers are under orders by William and (if still alive) HM to drive her out of the palaces. Camilla is only safe as long as Charles is around and I don't believe that the courtiers ever wanted this marriage, or HM. If upchuck dies before Cammie, she'd better run for Raymill and dig in deep. I can't see W&H being nice to her anymore. Fun times coming. Can't wait to see that day. I am going to have a huge party when this happens. Nothing better than a gitback party.